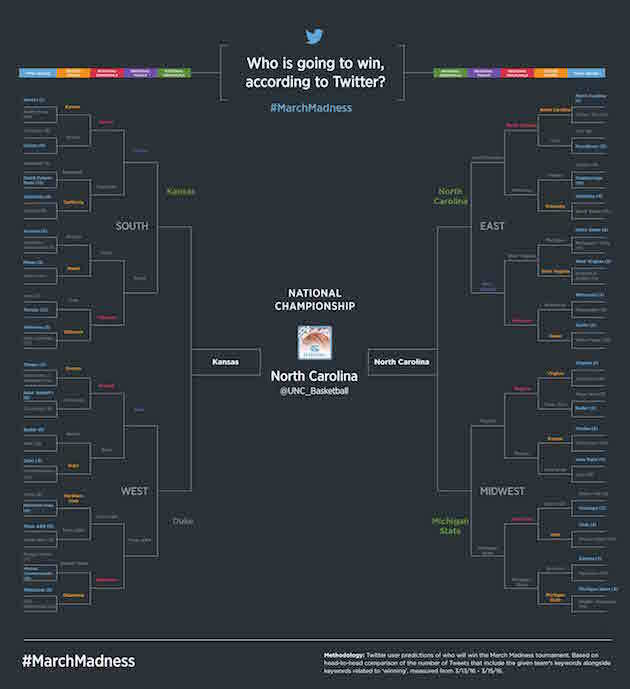 Twitter launched a March Madness bracket on Tuesday that predicts who will win based off tweets. The bracket was formed by the mentions teams received on Twitter, plus winning terms that were used in the tweets, from Selection Sunday until Tuesday morning. According to Twitter’s bracket, UNC will defeat Kansas in the national title game. Twitter also says Michigan State and Texas A&M will advance to the Final Four. Twitter also unveiled its eight hashtags and emojis for March Madness on Tuesday, which include #LetsDance, #MarchMadness, #Cinderella, #BracketBusted, #Sweet16, #Elite8, #FinalFour and #NationalChampionship. There will also be a Twitter moments tab specifically for March Madness until the end of the tournament. • What is really at stake in March? The NCAA tournament begins with the First Four matchups Tuesday night.